Alana shifts position to her other side. She heard a commotion earlier from people moving about, but she did her best to block them out. Some of the other travelers are the eager sort. They gawk at every little thing and talk loudly about what they had just seen. For hours. On one hand, going on the deck in this condition sounds like a bad idea. On the other… She wraps her arms tighter around herself. Maybe this will be a nice distraction. Hopefully it gets her mind off the rocking ship. Alana removes the cover and gets out of bed. Absolutely nothing has happened since they’ve boarded this ship from Alkidon. Some of the crew pass them on their way up as well. They mumble to themselves about some light they saw. Some of them fearful, others laughing it off and talking about all the sorts of things they’ve seen on the seas over the years. Alana keeps one hand on the starboard wall at all times as they go up the stairs. Alana squints. The space where the sky and the ocean meet does look different. Alana can’t deny that. A white glow comes across the horizon. A bright white line extends across as far as she can see. The glare isn’t strong enough to hurt her eyes, but it also looks troubling. A transition is only something she and Karlyn can see and experience. The white glow of moving between worlds, but everyone out here is commenting on this light. It does look similar, even though logic tells Alana otherwise. She realizes what about this sight is so unsettling to her. There is no sound. Looking at the waterline, she can see the light is moving the sea, but she can’t hear anything, not a thunderous blast or a roar of a strike. The light is completely silent. A pit grows in her stomach. Whatever it is, she wants no part of it. She spots the back of the captain’s head in the crowd. “Captain,” Alana call outs. Captain Orosco of The Emma is easily distinguishable with his blue jacket. His attire is always impeccable, giving the impression he was part of someone’s navy before becoming the captain of his own ship. His bronzed skin reveals his history out on the deck, and a courtly mustache with wax on the ends shows he’s not just a regular sea dog. He leaves and tells a few of the crew to get back to their jobs. While his answer isn’t much, his nonchalant attitude does calm Alana down slightly. That’s when Alana realizes it. Everything snaps into place. It’s not just a light on the horizon. The sun is dipping into the west, and everyone is staring to the east. The light grows brighter. Alana shades her eyes with her hand to get a better look at it. No, it’s not that the light is getting brighter; it’s getting closer. The horizon line speeds toward them. The two of them leave the gawking crowd. Those people have no idea what’s rushing toward them. She takes one last glance back as the first tendrils of light bathe over the ship. It’s here. They’re not going to make it. The ship’s railing, the people, even the ground disappears in white. Alana wraps her arms around Karlyn and the two of them grip tight to each other. 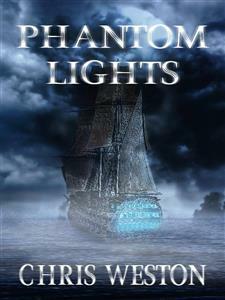 In the next moment, the light pours over them, and Alana feels her feet leave the boat. Her gut and chest rise to her throat, as if she was thrown, but Alana can’t see anything to tell if she’s in the air or not. The feeling of shock morphs into weightlessness, just like a transition. She closes her eyes, replacing the burning bright light to the light grey of her eyelids. The only thing she knows that’s real is her sister’s touch. Karlyn holds tight to her. As they hang in the air, Alana feels a coldness pass over her, like a wind brushing across her body. The next she knows, she hits the water. The force and momentum submerging them. Cold water is everywhere. Quickly, Alana and Karlyn let go of each other. Opening her eyes, Alana sees darkness. A moment of panic sends her heartbeat racing, and a few bubbles of air escape her mouth. Looking around her surroundings, she spots a portion of water with light. The surface. Alana gets Karlyn’s attention and points to where they need to swim. They take off. She isn’t sure she’ll make it. Her arms extend as far as they’ll go. Her legs kick as fast as they can. All sense of time and space are lost to her. The only sensations she feels is the heat from her face, and the pressure building in her chest. She pushes against more water. The last few air bubbles leave her mouth and she exerts all her energy to keep swimming. Her head breaks the surface, as does Karlyn’s, and they gasp for air. The sky is dark and gray. The bright light is gone. Alana looks around at the pieces of wood floating on top of the waves. No boat to see. Alana spits the water off her lips.She searches in every direction. Gone. Almost like nothing had ever happened. They couldn’t have been blown off that far from the boat. They were out in open ocean, with miles of water all around them.There is no way we were thrown that far away from the ship. The light carried them off, although Alana imagines it was a few hundred yards. She squints, convinced she just passed it over. There is one explanation for the ship’s disappearance and all the wood and debris on the ocean surface. The boat was completely destroyed by the light. But the light doesn’t stay on her mind long. She and Karlyn have an immediate problem to deal with: swimming. The bits of debris aren’t enough for one person to get on, let alone two. Soon Alana spots it, a lifeboat drifting away from them, somehow surviving the explosion. Alana and Karlyn swim toward it. They lift themselves inside. Alana flops in, the upper half of her body landing on the bench. She puts her hand on her chest. She feels her heart still pounding. Closing her eyes, she’s just thankful not to be stuck in the water anymore. Karlyn drags herself onto the boat and lies down face-first. Out of her shirt, Zizi tumbles out and hits the floor. The little black bat-thing uses a wing to upright itself. It coughs, spitting out some salt water. Zizi looks up to her with her big eyes and tongue hanging out over her body. Zizi falls on her side. After catching her breath for a few minutes, Alana sits up and takes account of what they have. No oars for them to use. She would assume they would still be in the boat, but it was just wishful thinking on her part. Karlyn says nothing, she just gives Alana a thumbs up. Alana jumps back into the water and starts swimming to the closest debris. Now is the only time to get supplies. Soon all the debris from the wreckage will drift off in different directions or sink. As she gets closer to a mass of wreckage, she reaches out and sifts through it. Pieces of wood the size of her hand. Useless. A chair leg. Not long enough. A thick cord of rope floats past her. Literally garbage. She finds half a broken oar. Alana grabs it and tucks it under an arm. This is fine. I’ll just bend over to use it. Not as if a full oar would have done them much better. It’s pure solid ocean in every direction. With the supplies in her arms, Alana takes off back to Karlyn. The return trip takes longer than expected as she only uses her feet to push her along. The excitement of having some control after this disaster gives her energy. Alana slumps into the boat and rests her arms on the side of it. She doesn’t feel a transition coming on anytime soon. She clicks her tongue; they can use one right now. If they’re lucky, they’ll have some solid ground beneath their feet. That would be a welcome relief. Otherwise, they have to find land out here. They’ve talked about swimming, but the conversation always stops when it comes to their destination. This world is new to them, they don’t have a compass, and they have no idea where they are. Every direction is the same color, the same probability of rescue: none. So they sit and wait. Alana lies on a corner of the lifeboat and falls asleep. She isn’t sure how much time has passed. It’s dark out. Her body is sore, even though she’s barely moved. Her tongue has a warm, thick slime over it. She feels the salt covering her skin. Alana rubs her face to wake herself up. Her hand comes back white with dead skin. With a slight groan, she grabs the side of the boat and pulls herself up. Karlyn is sitting in front of her, looking out into nothing. It was the same position she last saw her in. Zizi is out, circling above their raft. Alana leans on the edge of the boat herself. At first, Alana thinks the isolation has gotten to her. A dark blob moves across the top of the water far off. Alana rubs her eyes and clears her vision. It isn’t a delusion. The hit snaps Karlyn to attention. She notices the vessel. A light appears on the ship. Immediately she gets on her feet. Another light appears on the ship, and then another. Each of them pointing in their direction. It’s an actual rescue. Alana gets up as well, excited they’re not going to die from lack of fresh water. They scream and wave their arms to catch the ship’s attention. They scream, and scream, until their lungs are empty, so they take deep breaths and start over again. Their throats are ragged and hoarse. At first, it feels like nothing is happening. Alana and Karlyn continue to wave their arms and yell at the top of their lungs. The first light on the top of the boat waves back and forth. Of all the chances. Dying of thirst doesn’t seem as terrible of an idea to her right now. Karlyn calls Zizi down. A crew of pirates who have been out at sea for who knows how long is its own concern. Alana tries to avoid thinking about possible scenarios. Instead she focuses on what she can do. She took off her belt while on their previous ship. That’s at the bottom of the sea. Suddenly, Alana remembers the knife she carries in her boot. The knife is small, and the blade itself is barely longer than one of her fingers. Gotta make do. Alana puts the knife up her sleeve and tucks it by her wrist as the pirate ship lowers a rescue craft. They reach the deck of the ship. Alana helps Karlyn up. She notices Karlyn is favoring one leg. Alana wonders if Zizi decided to hide there before the pirates arrived. She saw Zizi go into Karlyn’s shirt. It’s possible she scurried down and hid in her boot. Before she can ask, there are the pirates to talk to. A total crew of thirty or so stand there watching them. That’s a lot of people to pick a fight with. She looks to the closest one of the group in front of them. He’s also the eldest. He has long, curly gray hair to his shoulders, along with mutton chops that connect to his mustache. At first Alana mistakes his shirt for gray, but she notices it’s a worn white shirt beneath a nice, if stained, burgundy vest. She assumes he’s in charge. “You’re the captain?” she asks. “Me?” he says with a smile. His voice is deep and growly, almost like a dog. The crew laughs at her question. Alana raises an eyebrow. She’s not sure what’s so funny, but the feeling she gets is that she assumed wrong. An awkward silence hangs in the air. She gets it now. They want to see her squirm and ask and embarrass herself. She puts both her hands behind her back respectively, making sure one of them holds the hilt of her knife. The captain stands tall and upright. If it wasn’t for his ridiculous red uniform and the fact that Wagner pointed to him, Alana wouldn’t have identified him as the captain. He seems a few years young compared to the faces of the crew he surrounds himself with. He snaps his fingers. In a sudden movement, one of the crew quickly snatches the knife from out of her hands. Alana swipes for it. Before her arm is fully extended, she knows it’s a futile attempt. The knife is tossed from one crewman to another, until it reaches Captain Rainer. He holds the knife up between them. The comment draws more laughter from the crew. Alana turns to Karlyn, who looks at her just as dumbfounded. What have we just gotten ourselves into? This is not what she imagined from a group of pirates. Baris blinks slowly and then suddenly. He comes to his senses and is aware that everyone on deck is staring at him. He begins to blush as he realizes what he said. Baris stammers to come up with something, but only gibberish comes out. Now a whole storm of voices chime in. Alana and Karlyn may have just run in-to the hungriest pirates that have ever roamed the seas. Alana closes her mouth because it opened during the entire exchange. Maybe it would have been better to keep floating on that debris. Salted meat. It sounds more like a threat than a gesture of good will to Alana. Her mouth is dry from the exposure of the sea. She’d rather some fruit like grapes or even a banana at this point. Her stomach lightly growls. She also knows she needs energy. The meat will be fine and settle in her stomach as she inspects this crew. As long as they have plenty of water to drink. Alana and Karlyn are given the cargo hold to change their clothes in. The privacy is nice, but the lack of a lock worries her. They’re still pirates, even if they are gracious. Alana was given a white shirt and a nice blue jacket in case she gets cold. Karlyn puts on a blue shirt and beige pants. The clothes fit comfortably enough. Zizi flies around the ceiling, inspecting the crates and cargo. At the moment, they’re guests, so hiding Zizi isn’t much use. They have no idea how long they’ll be here. A week if they head back in the same direction they came from, but that’s not likely. It’s better to let Zizi roam free. There’s no telling what the little bat-thing can come across to help them. None of the boots on the ship fit their feet, so Wagner has their boots drying on deck. Alana hates it. She wants her own clothes, with her own boots. A thick heel would be welcome right now. At any moment they can transform from guests to prisoners. All their weaponswere in their room when the ship was destroyed. Boots would give Karlyn and her a nice substitute. She holds back a groan. All those weapons they had collected over the years.Those were sent to the bottom of the ocean on the old ship. Besides weaponry, boots would be good for Karlyn right now. When the ship was ripped apart, something hit Karlyn’s foot. A long scab goes from her heel along the top to her toes. Her boot was compressing the wound, but when she took it off, it peeled off a chunk of the scab. Blood runs down the side of her foot. It needs to heal all over again. Wagner takes her and Karlyn right to the source in the mess. Eight of the crew are in here getting something to eat. They’re relaxing on the benches at the tables. Another two are working on the food. Salted meats, Rainer mentioned. Wagner gets her a cup and fills it to the top. Alana drains the cup into her mouth. Water spills out the edges and wets her shirt, but she doesn’t care. It’s fresh water. Clean, and pure, and it tastes so good. Once she’s finished, she wipes her mouth with the back of her hand. In the room stands a tall, ornate, bronze statue. From top to bottom, it looks like a cloaked figure with the cloak spreading out in waves. Arms stick out from inside the cloak in all directions. In the center is a green-black orb. Alana stands close to it and picks at it with her finger. The orb is blue and copper. A silence falls on the crew.